Device Magic users now have the option to send their form data to Microsoft OneDrive with a PDF, Word, XML, or Images destination. In this article we'll give a walkthrough of creating this destination. Once you’ve saved your form and exited the designer, you will arrive back at the Forms page. Go to your "Forms" page and click the link in the destinations column of the form you would like to add the destination to. 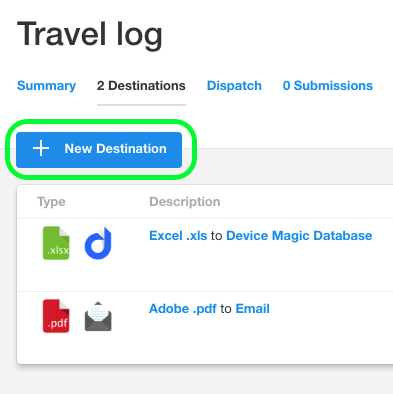 Now, once you’ve been taken to the Destinations page, you can click the “New Destination” button. A new page will load, and on it you will see different destinations to send your data. Select "Microsoft OneDrive" as your destination and the format in which you'd like to deliver the information. In this example, "PDF" has been selected. Below your "Destination Options" section, additional formatting options will appear depending on the format of your destination. If you'd like more information on PDF options, please have a look here. Next, click the "Start authorizing with Microsoft" link and a new window will appear with the sign-in options. After inputting your Office 365 account details and successfully signing-in, the window will automatically close and your Office 365 account will be added to step 6 on your destinations page. You also have the option to create a folder path (which can be customized using the placeholders provided). When you're done, click "Create Destination". 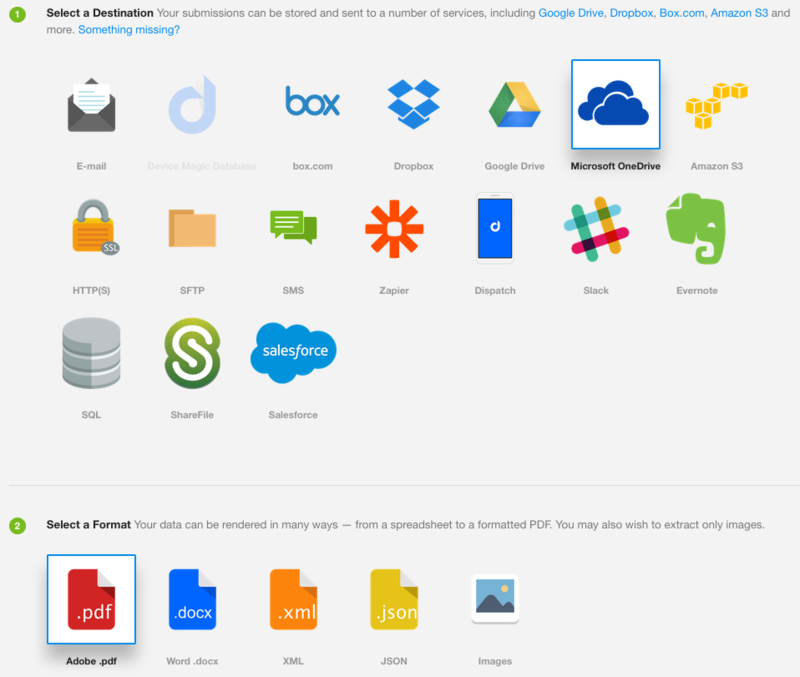 This concludes our overview of adding the Microsoft OneDrive destination. If you have any questions or comments feel free to send us a message at support@devicemagic.com.